These look lovely! Well done! Ooh, can't wait to try these! Your enchiladas look absolutely delicious! I can't wait to try this recipe. Great picture! I just LOVE enchiladas and this recipe is simpler then the one I do, definitely worth trying! I love to make enchiladas. I prepare my tortillas in another way than you do, but I tend to have issues with them turning kind of mushy under the sauce during the baking process. Saw that you bake yours without the sauce for a while, with the cooking spray. i'm assuming this crisps the tortillas nicely to stand up to the sauce - great idea. Will have to try! These look so DAMN good cannot wait to try them!! Thank you so much for this recipe. I tried it this week and it's wonderful. We can't get good quality Mexican food here in Germany, so I have to make it all myself and this is exactly what I was missing. These just came out of the oven and wow, they are good! We are "spice wimps" so I cut the jalapeno and chili powder amounts in half and it is perfect for us. A big thank you! These are the best chicken enchiladas we've ever had. We had them three days ago and my husband is still talking about them! I didn't add the jalapenos because my littles can't handle it yet, but they were still incredible. Thank you so much! I made these a couple nights ago. They were delicious! My two-year old and my six-year old ate it! That makes it an absolute success. Thanks. About to put these in the oven now. I cheated and tasted the filling already. Holy yum! Thanks for posting such a great recipe! I made these for my dinner group and everyone loved them! I am making them again for out-of-town company---thanks for the recipe! I made these for Thanksgiving and they were a hit!! I tripled the recipe, made 3 pans and they were all gone by the next day. The sauce is so much better than store bought...worth the little bit of extra effort! Hi there - thanks for the wonderful recipe. I made it exactly to your instructions on Saturday and my husband LOVED them. They were seriously the best enchiladas we ever had! Next time though, I will make more of the sauce, as we couldn't get enough of it. Thanks again! These were delicious, and they'll definitely be made again. Thanks for posting! Great recipe, the whole family loved them. I used flour tortillas and they were very good. these enchiladas are the best I have ever had! You can not go wrong with a Cooks Illustrated recipe. I made these last night and while they were good they somehow came out sweet! I don't know how that could happen with all that chili powder and two jalapenos. I don't know if I'll try making it again I was really disappointed. These are the BEST enchiladas EVER! I have made these several times, and every time I finish with dinner, I can't believe how awesome they turn out. Thank you thank you thank you for such a great recipe. I'm really sorry they didn't work out. I've made them countless times from my posted recipe, as have many readers. They shouldn't be sweet at all, so I'm not sure what could have happened. I'd definitely try them again - they are worth it! these are wonderful, I have made them twice so far and varying the recipe with what is at hand is fun and never seems to fail. Thanks for sharing them! Just found your site, we are doing Mexican Christmas with my brother and his wife and I am going to make these. They look FANTASTIC (and easy!). You blog is being followed from Turkey now :))) I can't wait to make these! I love enchiladas!!! I am generally too lazy to follow instructions that tell me to do things like strain a sauce, but I am so glad I did this time! I had no idea I could make something like that. Also, I love this recipe because all of the ingredients are available in Germany where people think kidney beans are the proper beans for Mexican food. So, thank you for making my belly happy! Perhaps the anonymous with the sweet issues used a tomato sauce that already had sugar in it? Just a pinch of sugar can make the difference between perfect and way too sweet in a tomato sauce. These are not enchiladas. They are entomatadas. Enchilada sauce is made from red chili pods that are dried, stewed, strained, spiced, and then thickened with a roux. There is no tomato involved. I hate to be so technical, but there is an important distinction. If I ordered enchiladas at a restaurant and got this, I would send them back. I just made this recipe and it was fantastic! I did substitute boneless skinless chicken thighs instead of the chicken breasts, but I just wanted to say Thank You for a great recipe that will definitely turn into a regular at my house! Made these tonight...one of my first internet recipes. I got an A+ from my wife and daughters! I thought this was delicious except 3 TBSP of chili powder seemed to be a bit too spicy, even for my boyfriend who likes spicy food. Next time I will make it with maybe 1 or 1 and a half. Otherwise it's awesome. Thanks! I made the sauce tonight for the second time and love it! Unfortunately I didn't have jalapeno so I subbed in a chipotle in adobo, and I used crushed tomatoes. These subs seemed to work fine! Made this for dinner last night...absolutely delicious!! Thanks so much for sharing the recipe, it's going to be a regular in my house for a loooooooong time!! Making these for dinner now... They smell amazing, already tried a bit of the sauce and it tastes so much better than store bought! Loving the spiciness. Thanks for a great recipe, will be making them like this from now on. i found these on Annie's Eats blog, they are AMAZING! so delicious, they certainly rival those from our local tex mex restaurant! My husband adores them, and they have become my new favourite meal, thanks so much! Made these for dinner last night and they were absolutely delicious. Looking forward to the leftovers for dinner! These really are the best enchilladas. I have made them numerous times now and every time they are delicious. Tonight I have added chipotle for a slight variation. I cannot agree that these are excellent: No so called "enchilada" that has a significant amount of tomato will ever get into my top 100 list, much less 'best ever". However, for a gringo-ized dish, these do appear to be lovely. Made these tonight for my family and they LOVED it!! (I'm on a diet right now, so I couldn't taste it!! *cry*)I only had crushed tomatoes instead of the sauce, but it turned out fine!! My father, who is a very picky with his enchiladas, couldn't stop eating them!! My mom doesn't like the chicken, but I figure I can just substitute cheese in hers next time with some of the onion mix put aside for her! My brother loved that it was the right amount of spicy! Thanks for the recipe, heres how mine turned out: imgur.com/a/gWAs5 . They are in my oven right now. The mixture is amazing. Can't wait to try the finished product!! I made these last night for dinner...DELICIOUS! Full of flavor and easy to make. Will definitely save this recipe for the future. These look absolutely DIVINE! OH MY I cannot wait to try this!! We just started following your blog! We saw you on pinterest! These are very good. I like the kick the jalapenos give. I found it to be a time consuming preparation though so I'm not sure when I will make them again. I followed the recipe to a "t" but they sure didnt look like the picture! These are in the oven as we speak...delish...easy...budget friendly....Thanks for sharing! Hi Josie, I sent you an email. I had to share this recipe, and I put in LOTS of credits and links to your blog. So YUMMY! You have a wonderful blog, full of gorgeous pictures. So glad I found it! Being that enchiladas are most definitely my favorite food I was really looking forward to these. I made them last night and I am convinced I must have mucked them up somehow. As one other person mentioned, mine were rather sweet as well (I am not a fan of sweet AT ALL). With so many people who absolutely love them I will have to give them a second try another time. I'm sorry they didn't work out for you. The only thing i can think of is did you use the canned tomato sauce or spaghetti sauce? If you accidentally used pasta sauce, that would make them sweeter. Other than that, I have no idea - they shouldn't be sweet at all! These were the BEST home made enchiladas I have ever had. So easy and a hit with my husband. Highly recommend. I'm dying to make enchiladas but am very intimidated by them. these I might have to try. I made this recently and they seriously are THE BEST enchiladas I've ever made!!! I will definitely be making them again. Thank you!!! These were good, but they took FOREVER to make. If I were an experienced cook, I could have probably shaved off some time, but it was almost 2 hours from start to finish. Nothing I've ever eaten is worth 2 hours of my time after work, but they definitely were yummy nonetheless. We had these for our Chrismas Eve meal. They were a hit with everyone! Very nice flavor and they will become a favorite! Just made these tonight. They were a hit! Thanks for the great recipe!! Would it be possible to cook the chicken in a crockpot instead of on the stovetop? Also, is it possible to start with frozen chicken? Tiffany, I can't really make a recommendation on that since I've never tried it, but it doesn't really take that long on the stovetop. You're already simmering the sauce, so you might as well cook the chicken in there with it, you know? I also don't think I would start with frozen chicken since it would take so much longer for it to cook, and the sauce could therefore cook down too much. Good luck! Made these for dinner tonight and they were a hit. I've never had an enchilada with a tomato sauce, but I do like your technique of cooking them for awhile before adding the sauce and cheese. Do you really get that mild crunch of traditional fried tortillas without the fat? Normally we fry ours 30 seconds a side before we roll them. One comment, please stick to corn tortillas. Flour tortillas will ruin a perfectly good dish. These are DELICIOUS! This is my mom's favorite thing ever; she's even having me make them for her birthday instead of going to a restaurant! They take some time to make, but they are totally worth it! I used flour tortillas because that's what I had on hand, and they still came out great. Thank you for the recipe! My first time commenting on anything and this receipt is def worth a comment. Mine actually made 10 my only complaint was I didn't have enough sauce but will correct it next time I make these. Loved!!!!! I made these tonight and they were ok. I think next time I'll double the jalapenos since mine had no spice to it and add more cheese. How do you get the tortillas to not be mushy? I have made dozens of enchilada recipes and can never get an enchilada that is not extremely mushy? I sprayed and cooked but it became mushy after I added the sauce. Oh well. THese look SOOOO GOOOD! I love enchiladas! I made these for dinner tonight and they turned out great! First time ever making enchiladas. Only thing different I did was using flour tortillas since I couldn't find corn. they were AWESOME! My three children (6, 4, and 2) even loved them! We put a little bit of sour cream and guac on top. I also kept a little enchilada sauce and poured it over some leftover plain rice I had and used it as a side! With that and some sweet corn it was a great dinner! These were better than any enchiladas I've ever eaten, even from a restaurant. They took awhile to prepare, but totally worth it. I made these tonight would you mind if I posted your pic with full credit in my review post ony results? Sure, Hillary. As long as proper credit is given. thanks! I have made these several times now. So delish....as for the girl who's turned out sweet...you have to add salt to taste....everything in the recipe is sweet...onions, tomatoes, jalapenos....it's also good if your chicken is well-seasoned....I love this recipe! Thanks for sharing! I made this last night and it was a big hit with my husband. He has some sensitivity to spice so we made two batches in the oven - one without the sauce poured over it and one with it. He ended up using some of the reserved sauce when he sat down with his plate but didn't want them drowning in it. They were absolutely delicious and way better than the store bought kind. It was very time intensive so I'll probably reserve this for a weekend dinner but it was great nonetheless. Very disappointed -- this sauce was awful. No one in the family wanted it. Threw it all down the sink. But luckily did not ruin the chicken by placing it in the sauce. I followed the recipe exactly (except for putting the chicken in). I make enchiladas all the time. Just wanted to try a new recipe -- mostly because the picture posted of them looks so good. How can people say this was not sweet? There are 3 tsp of sugar in the recipe. I wish I would have not even put in the sugar. And yes, I checked the tomato sauce -- there was no additional sugar. Guess this Texas girl is used to hot & spicy Mexican food -- not sweet. Anonymous, I'm sorry they didn't work out for you. This is a good example of tasting as you go and adjusting spices and seasonings according to your taste. I hate that you felt like you couldn't save it, because if the sweetness was the problem, you could have added some cayenne and/or hot sauce. My jalapenos were probably more spicy, since they were home-grown. I don't eat sweet Mexican food either, so I don't want you to think that I and they definitely shouldn't be sweet. I have made these more times than I can count, and have had dozens of people make them with stellar results as well. Using a good quality chile powder also makes a big difference in my opinion. Again, sorry they didn't work out for you! Found your recipe on Pinterest. I'm making it for the 4th time tonight because our family loves them so much! Yum! Have you ever tried freezing these enchiladas to warm up later? I'm wondering how that would work. Made these the other night and they were great. Really authentic and delicious! A bit time intensive, but definitely worth it. Anonymous, I have frozen them. I usually freeze the enchiladas and the sauce separately, then when I'm ready to cook, just thaw them out and cook as directed, starting with the 7 min before adding the sauce to let them crisp a little. Hope that makes sense! I've made these in the crock pot successfully. Instead of cooking the sauce separately, I puree all the sauce ingredients (raw) in the food processor, and add the uncooked sauce and the chicken to the crock pot. Add an extra 1/3 cup of water to account for evaporation, and cook 6 hours on low. They're great! Made these tonight followed recipe, except I added black beans and 2 bell pepperS instead of onion, and holly were they ever delicious! Made these tonight. Everyone loved them!! I only used 1 pepper and I am glad I did. They would of been way to spicy for us. I was surprised because we usually love spicy food. My my pepper was hotter than most. Anyways thanks for the recipe!! These look awesome and will have to try them. About how many does one recipe make ??? I have hungry growing boys and need to make sure they get full. Oh never mind. I found it makes 12. Making them tonight. Yum! I wanted to make enchiladas today and am going to use your recipe instead of mine...they sound so delish! Yikes these look good! I just saw this pic on PINTEREST Josie, clicked on it...and it's yours!! woohoo! Loving this dish! Hello, is the enchilada sauce suppose to be super Spicey? Because mine is and I only used 1 Jalapeño. Spice tolerance is so different from person to person, so I can't really say if it should be "super" spicy. It should have a little bit of a kick, but not be overwhelming. My daughter can eat it with no problem. Spice levels vary dramatically from one pepper to another, so I think it's important to taste a little bite of the jalapeno before you use it to see how spicy it is. As a general rule, smaller jalapenos are spicier than larger ones though. This is my FAVORITE enchilada recipe!! I have made it several times and it is so easy. It's not hot at all if you cook the peppers with the onions and release the flavors. Just make sure you seed them (unless you want more spice, then leave them in that case). The ONLY change I make to the recipe is adding more tomato sauce - the first time I made it I felt like it needed more to cover the tortillas and add to the filling. Delicious and simple. Thanks for sharing Josie!! Thanks so much for this recipe! I'm vegan and By replacing the chicken with tempeh and the cheese with Daiya cheese, and the sugar with sucanat, I turned this into one of my all time favorite dinners for my family! With a side of Mexican Black Beans and Rice, this is a hit!! These enchiladas were really good but I will make some changes next time. Mine were not spicy at all (I used two jalapenos) and I found them to be on the sweeter side, as many other users commented. Next time I make these I will omit some of the sugar and add an extra jalapeno or a dash of cayenne pepper. Can't wait to try them again! Thanks for the recipe! LOVE Love love .. This was a hit for Girls night. Rave reviews will be making this often!. Instead of using the 2 jalapenos I used 2 Tablespoons of jared sliced jalapenos minced and it added just the right amount of heat. Made these last night and we loved them!!! Thanks for sharing... I'm up to 4 recipes...lol... I'm working on it! I'm making these tonight. ANY tips for a newbie cook, these seem pretty advance :-/ Excited to give them a try! After finding this recipe and trying it for the first time it is now an entree in my home AT LEAST twice a month (maybe 3 or four!!) My family LOVES it and I'm sure it's gonna be in my recipe book for good now! Thank you so much for sharing! I'll be making these AGAIN tonight. It's become a regular dish in our home. Everyone loves them and they're even good as left overs. They really aren't too expensive to make. The only downfall is the amount of time it takes me to make them. 2-3 hours but WELL worth it! Oh and for the readers who say they're too sweet or too spicy, I don't use any sugar, I use a little less chilli powder, and I use canned prechopped jalepenos. They're perfect! For the people that don't like the spice or have young kids a great way to do it is make a mild sauce and add the extra kick to your own filling .. I don't like cilantro but my husband does so I put it in his enchilada and mark it with a toothpick .. same with the extra spice .. some chopped Jalapeno's in some and not others .. works out great ..
For the chicken .. What I do is get a large pack of chicken breasts and add it to a crockpot covered with water or chicken stock the night before .. when you wake up the chicken will almost fall apart on its own .. I freeze in food saver bags at about a cup per bag ..
these are great btw .. I love the baking for crispness .. Thanks for the great recipe !! WOW -- i loved these enchiladas! I am not a huge fan of enchiladas but these are awesome . I used skirt steak instead of chicken and they were just finger lickin good! thanks so much for the recipe . I will definetly be making these again! I have made this a few times and it has been wonderful each time. first two times I didn't use the Cumin or the Jalapenos and they still tasted great, the last time I did use those ingredients and it was Delicious! Thank you So much for sharing. Its one of my Husbands favorite dishes now! I made these, they were great. I really don't like enchiladas either, but decided to give these a try. Here's the changes I made: Only used 1 jalepeno, 1 tsp sugar (they were still too sweet next time I won't use any sugar), omitted water, added black beans to the mix and used a can of stewed tomatoes instead of chopped tomatoes, garnished with chopped tomato and green onions. Oh my god...these were sooo good! I usually follow a recipe exactly the first time I try something, but unfortunately I didn't have all the ingredients so I substituted some things. (I hate it when people write reviews based on their own change in recipe, but I can't pass this one up, sorry!) I didn't have jalapenos (plus, I don't like hot hot food anyway), tomatoes, montery jack cheese, cilantro, or corn tortillas (yikes! that's a lot of the ingredients!). I didn't substitute the jalapenos; I used a can of diced tomatoes instead of fresh tomatoes; I used mozzarella instead of montery jack; i used dried parsley instead of the cilantro (really wish I had this, as cilantro has a pick-me-up flavor); and I used flour tortillas instead of corn tortillas. However......it was delicious, and it makes me all the more excited to get the actual ingredients this recipe calls for! Thanks for sharing! My neighbour and I have decided to have a "Pinterest" dinner night every 2nd Sunday. We're both avid Pinners and we both drool over the amazing recipes that we find. Tonight was our 2nd Pinterest dinner. I made these Chicken Enchiladas! O.M.F.G they were sooo good! I had never eaten an enchilada before, ever... let me tell you that I will from now on! I'll use this recipe too! I also made Smashed Potatoes and my neighbour made Key Lime Cheesecake squares! PERFECT combination! Just made these, they were amazing! I have made these 5 times! I'm obsessed! Have you ever tried to freeze these? I am making them for a friend and she may need to freeze for later? Success or no? Thanks for posting this amazing recipe--my family loves them!!! 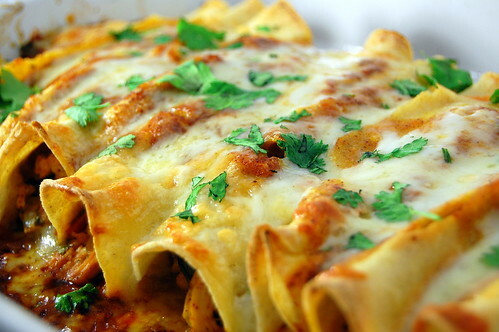 I love all kinds of Enchiladas, but these look so delicious! Congrats for the great blog! Hmm... while these look delish, I just can't see how these are authentic enchiladas. Perhaps they are better than chain restaurant enchiladas but not an authentic Mexican restaurant because enchilada sauce is chili based not tomato based - perhaps that is why some find the sauce sweet because authentic Mexican cooking will use Mexican chocolate which isn't that sweet not sugar - tomatoes with natural sugar and additional sugar will make the dish sweet for those with sophisticated traditional Mexican palates. I would suggest substituting the tomato sauce and sugar for Las Palmas Enchilada Sauce from your local market. LOVED this!!! Made it tonight. I used rotesserie chicken and cut the time down. Still turned out fantastic!! Thanks. Just made these :-) They're in the oven right now! It's taken us a couple hours to make, but I'm sure it will all be worth it!!! These are in the oven right now!! Everyone is very excited to try these in my household :) Thank you! These were great... I used canned tomatoes instead of fresh as that was what I had on hand. I tasted the sauce before I added the sugar and only used 1 teaspoon. I also used frozen chicken breast and let them simmer on low in the sauce. This is as far as I have gotten. I haven't put the enchiladas together yet. My chicken is still simmering and my tummy is grumbeling.. it smells so good. I appreciate your article,thank you for your effort,I will inform this to my friends. We had these for dinner last night! So good! Thanks for sharing!!!! Made these for dinner last night and they were AMAZING! Best enchiladas I have had in a while, thanks for the great recipe! I made these tonight. They weren't BAD but they weren't GREAT either. I should have read the comments beforehand. Next time, I would omit the sugar. Like the others, I found it a little sweet. (I thought it was just me!) They also turned out mushy on the bottom!! I'm not sure why. This was pretty time consuming but I enjoyed it. I will try this again though. Fingers are crossed! loved this recipe!!! my fiancee loved it as well! thanks for sharing!!! Normally I am a terrible cook...it's kind of a running joke with me and my husband. I made the sauce and tasted it and I thought "darn I screwed up another dish" it didnt taste that great. But I finished the recipe and to my surprise these were AMAZING...turned out great. Thanks for making me into a good cook for my husband for once! Has anyone tried this recipe with ground beef? My husband isn't a chicken fan. I've never tried it with ground beef. But if you were to attempt it, I would brown the beef in the pot, then remove it, add the onions, and proceed with the sauce as directed. Then just simmer the sauce for 15 minutes or so since you won't be cooking the chicken in it. Hope that makes sense! I made these for my family and they were the best I have ever had, even the kids loved them! I made your enchiladas tonight and I must say they were fantastic! I bing.com "best damn chicken enchiladas" and your recipe came up in the first five. I did a few things different because, well...I read, reread, reread and still get recipes tangled. Anyway, I cooked the chicken in the finely chopped onions, garlic, and jalapeno as well as cumin and sugar then added broth until the chicken was done; strained the chicken apart from this concoction and added to a simmered tomato sauce with chili powder and more sugar for maybe 10 minutes. Me and my boyfriend loved them! He, of course, thought there wasn't enough chicken but that is easy to add more for next time I whip these lovely's up! Ahh...maaa...ZING! These were wonderful! I wish they weren't so time consuming, but definitely worth it! I follwed the recipe exactly, except I omitted the tomato. I did not substitute anything for it and I don't feel it was missing anything at all! Thanks for this recipe! This was truely delicious and amazing but took me about 3 hours to make. It would be helpful to include total prep time in the recipe! P.S. Thanks for the recipe it was a big hit!!! simple ingredients and easy to make. love this dish! does take a little time but is really worth it in the end. I am making these for the second time right now...my favorite enchilada recipe I've tried! I've seen a lot of comments about the sauce flavor, but what I like about your recipe is that it's so easy to alter to your own tastes. I make the sauce as is an then play with adding cayenne and black pepper until the heat balances out the sweetness of the sugar and tomatoes. My tortillas always seem to split open despite softening them first, so they don't look as pretty as yours, but overall it is a beautifully messy dish! Easy to make, I'd say 45 minutes prep time with the sauce, tops, if you're using all fresh ingredients. Thank you so much for this recipe! This is the second time I am making them, and they taste better than what I get in most Mexican restaurants! Love them! I live in Tucson, Az. next to the border, where we have tremendous Mexican food! These enchiladas were time consuming and I didn't enjoy the sweet taste from the sugar. Cooking and resting time alone took 1 hr. 20 min. Chopping,straining, & shredding...all together it took about 3 hours to make this meal. Then there was clean up time...The enchiladas were good, but not worth all the effort. The photo is beautiful! These are heavenly! Thanks for the recipe. Made them after Thanksgiving & Christmas: used up all of the leftover turkey. Purchased homemade white corn tortillas from a local taquiera, made all the difference in the world. Just tasting the sauce before baking made my knees get weak. So far, I am very impressed. We will see how picky family likes them. I will LOVE them and don't care for chicken. I loved them but I will definitely use less chili powder next time.. I used ancho chili powder so I am not sure if that added an extra kick. Also my tortillas were a little crispy on the ends so I will make sure the next time I will cover every last bit with the sauce. Thanks! I just made these for dinner tonight and they did take a long time, but they were worth every second! My Husband said they were the BEST thing he's ever put in his mouth. ... Thank YOU for the meal!! But yeah, thanx for spending the time to talk about this matter here on your internet site. What's up to all, it's in fact a good for me to pay a visit this web page, it includes precious Information. In fact no matter if someone doesn't understand after that its up to other people that they will assist, so here it happens. quicker to implement and also detailed. There's a lot where you could possibly choose that generate cash from blogging any kind of garden barbecuing. Smoke/Fire/Carbon Monoxide Danger: Smoke/Fire detectors has to be placed in you knew each love room, for the corridors, nearby the residence, with the heater, towards the hot water air conditioner, as well as any section that can be split such as other countries in the house. They should be lead rrnside the technique as the working returned items to fully cleansed the lining and as well as outside of the most important cooker. recognise that their supplies are able to advance as soon as more right into a filthy confusion you wish the entire hoarder can help one major "dumpster dive" or possibly a stop at garage sale, retail store or possibly a eat processed things you eat. Hi there it's me, I am also visiting this web site daily, this web page is really fastidious and the visitors are genuinely sharing fastidious thoughts. for not positioning this submit upper! Come on over and visit my website . the "correct" the factor in all of the problemthat fresh, advanced, and various draws near are perhaps evaluated besides. you buy one that does sell required available for you either of them. the right different models are able to keep your psyched for your upcoming team excursion! How did it take you 3 hours to make this? There is less than 1 hour of actual cooking time (I can math). So it took you 2 hours to chop an onion, a tomato, two jalapenos, and 3 cloves of garlic? Really? I made this in a little over an hour in a tiny college apartment with limited cooking utensils. These are great!